If you’re an avid sandwich lover, then one way to kick-start your day with enthusiasm is by making a delicious crispy sandwich. Although you can use the oven to accomplish this, one outstanding kitchen appliance that will define an ordinary sandwich from a café-quality delicious sandwich is a Panini press. Rated as one of the most useful multipurpose kitchen appliances, a Panini press is able to make a wide range of breakfast buffet for you and your family ranging from eggs, bacon, toast breads and pancakes among others. In this post, we will not only guide you on how to make your purchase but we will also review five of the leading Panini press in the market today. Please read on. Although indoor grills can’t overtake the essence of traditional outdoor charcoal and propane grills, they have the capacity to give you the taste and aroma that most outdoor grills can’t give. With that, one appliance you can’t miss to add in your kitchen arsenal is the Cuisinart GR-4N 5-in-1 Griddler. Made entirely from brushed stainless steel, this Panini press takes kitchen matters in its own hands by functioning as a contact grill, a Panini press, full grill, full griddle and as a half grill/half griddle. When it comes to the performance, this appliance is capable of cooking anything from pancakes, sausages, hamburgers, Panini to grilled cheese. When it comes to clean up, this Panini press features non-stick removable and reversible cooking plates and grills that are dishwasher safe. Alongside the plates, there’s a drip tray that collects the extra grease from food. Finally, to eliminate any guesswork from your cooking endeavors, the Cuisinart GR-4N 5-in-1 Griddler comes with easy to use temperature control knobs and an indicator light that shows you the status of the appliance. Whether you’re grilling chicken, steak, vegetables, bacon or eggs, the Cuisinart GR-4N 5-in-1 Griddler is exactly what you need to make grilling more fun and captivating. This Panini press is available at an affordable price. The 5-in-1 functionality is perfect for customers with small kitchens. The temperature range of 200°F to 425°F is perfect for grilling a variety of different meals. The plates are non-stick and dishwasher safe meaning cleaning is really fast. The brushed stainless steel cover is both stylish and heavy-duty. This Panini press is small and quite unreliable for big parties. The heating element sometimes fails to work leading to uneven cooking. 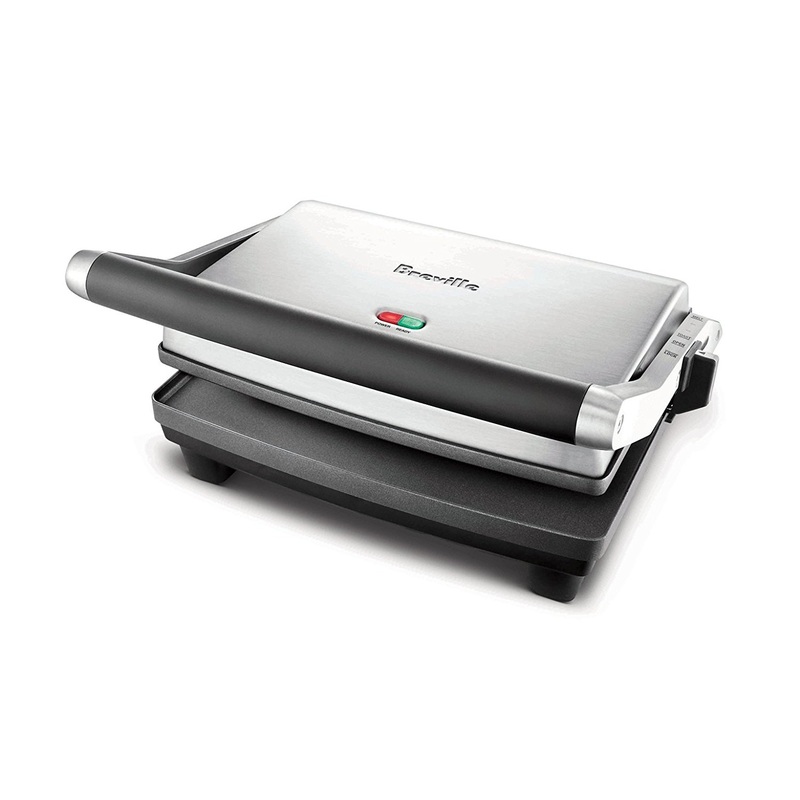 Finally, the Cuisinart GR-4N 5-in-1 Griddler is the best solution for those people searching for a reliable Panini press. At a price point that’s just below $100, I think this appliance is worth buying as its affordable, reliable, multipurpose and relatively easy to use. In case you’re not a fan of Cuisinart, why not check out one of its closest rivals—the Breville BSG520XL Panini Duo? Well, just like the Cuisinart, the Breville is also a domestic indoor appliance that accomplishes most of the indoor grilling projects quite fast and remarkably well. Designed with a top flat surface and an adjustable sandwich grill, the Breville BSG520XL Panini Duo is capable of not only cooking Panini but also preparing a variety of other delicious meals such as pancakes, eggs and steaks. Speaking of the adjustable handle, users have the freedom to adjust this sandwich grill to form grill marks on your favorite foods. To touch on the performance, let me mention that the Breville features a 1500-Watts heating element that heats pretty fast to provide considerable flexibility when cooking a variety of foods. To make cleanup a breeze, the surfaces are crafted from non-stick scratch proof Quantanium surface. Designed with an integrated on/off function alongside ready lights for notification, the Breville BSG520XL Panini Duo is a must-have for any Panini or rather kitchen enthusiast. The Breville Panini Duo is sturdy and very easy to use. The 1500-Watts heating element is powerful enough to cook a variety of meals. The grill surfaces are both non-stick and scratch resistant thanks to the unique Quantanium construction. The flat base style is perfect for cooking eggs, pancakes and other delicate meals. The cooking plates are not removable. This Panini press lacks temperature adjustment knobs. It lacks an on/off switch. Overall, the Breville BSG520XL Panini Duo is a high-quality kitchen appliance that does a remarkable job of cooking your favorite meals. Although it has everything one would wish for, lack of an on/off switch is a real drawback especially in an appliance that draws 1500 watts of power. Other than that, this Panini press is powerful, versatile and quite affordable for all customers to buy. We all enjoy adding some class to our daily foods to make them more delicious right? Now, one way of enjoying restaurant-quality meals is simply by using a Panini press. If you’re a Cuisinart diehard, one such appliance you can consider adding in your kitchen collection is the Cuisinart GR-1 Griddler Panini. Why is it the best? Good question. 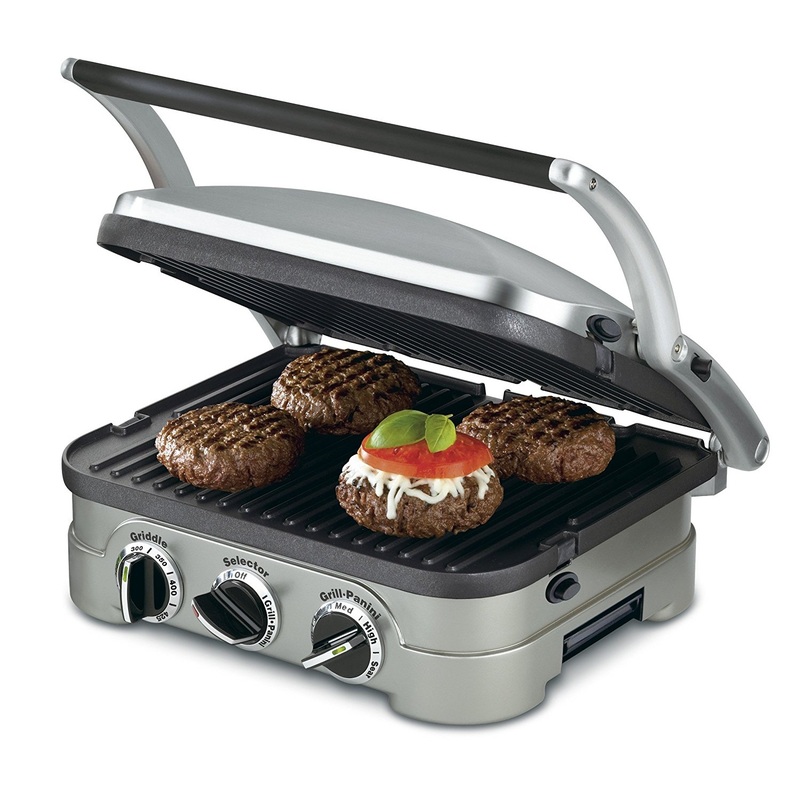 The Cuisinart GR-1 Griddler Panini has been welcomed with positive criticism due to a number of factors. First, this Panini press is coated with polished stainless steel housing that bears the “Griddler” logo at the top. When it comes to cooking your favorite meals, the Cuisinart GR-1 Griddler Panini lets you do exactly that thanks to its wide 11×7 inch non-stick non-removable grill plates. With the available temperature preset function, indicator lights and a recipe book, you can cook anything from vegetables, pork chops, sandwiches and cheese bread among others. 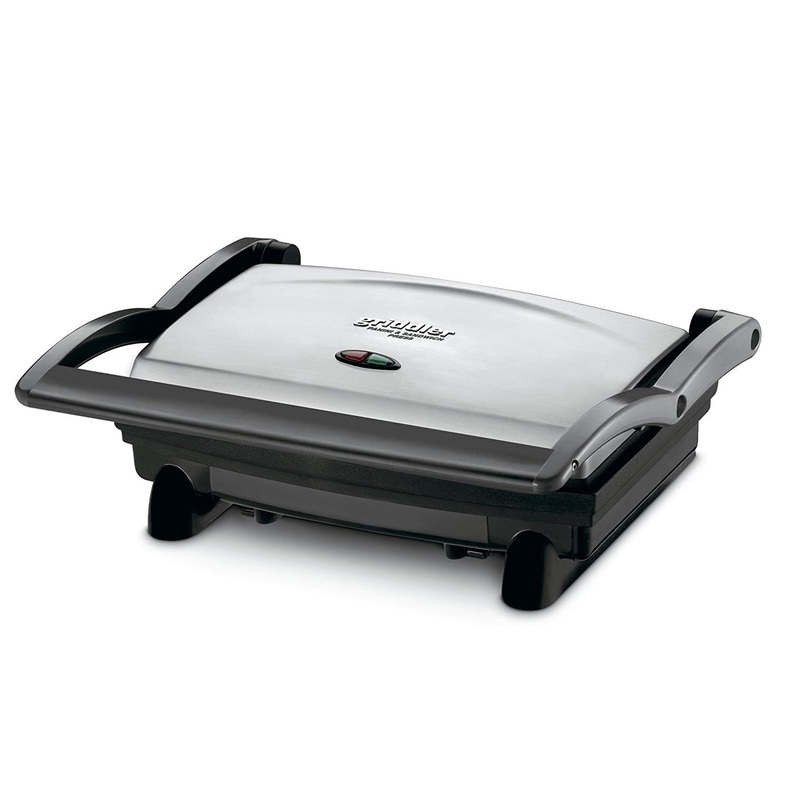 The Cuisinart GR-1 Griddler Panini is very easy to clean thanks to the non-stick grill plates. The plates are wide enough to handle both small and medium cooking projects. The stainless steel casing coupled with an embossed “Griddler” logo makes this Panini press look stylish and more professional. The floating hinge allows the grill to adjust to accommodate sandwiches of any size. The package comes with a recipe book and a cleaning tool. This Panini press doesn’t have an on/off switch so you have to plug and unplug directly from the power source. Sometimes this griddle can cook your sandwich unevenly. Although there are some drawbacks, I don’t think they’re enough to outweigh the many benefits offered by this Panini press. Coated with stainless steel housing, this kitchen appliance is stylish and perfect for both small and large kitchen countertops. It has large non-stick plates, power on indicator lights, a cleaning tool and a recipe book. Are there IMUSA diehards in the house? Well, if there’s any, then the IMUSA USA GAU-80102 Large Electric Panini Press is exactly what you need to take your grilling experience to a new level. Also coated with a stainless steel exterior, this Panini press features an IMUSA logo alongside two indicator lights at the top. The floating hinge makes it easier for you to adjust the height while the cool touch handles make it easier for you hold the appliance for perfect adjustment. Now, unlike other appliances with a similar price range, the IMUSA’s cooking surfaces are both flat (top and bottom plates) meaning it lacks a grill plate. This is one drawback I’ve noted as sandwich lovers will not enjoy their favorite ridged grills they usually experience with other Panini makers. Though the disappointment, IMUSA has managed to compensate its brand diehards with super large cooking plates that measure 12×10 inches. With such wide plates, you can easily cook anything from meats, veggies to sandwiches enough for you and your family. The IMUSA Panini press has large plates that are perfect for cooking large meals. The polished stainless steel exterior is both stylish and sturdy. The plates are non-stick making it easy to clean. This Panini press cooks food really fast. 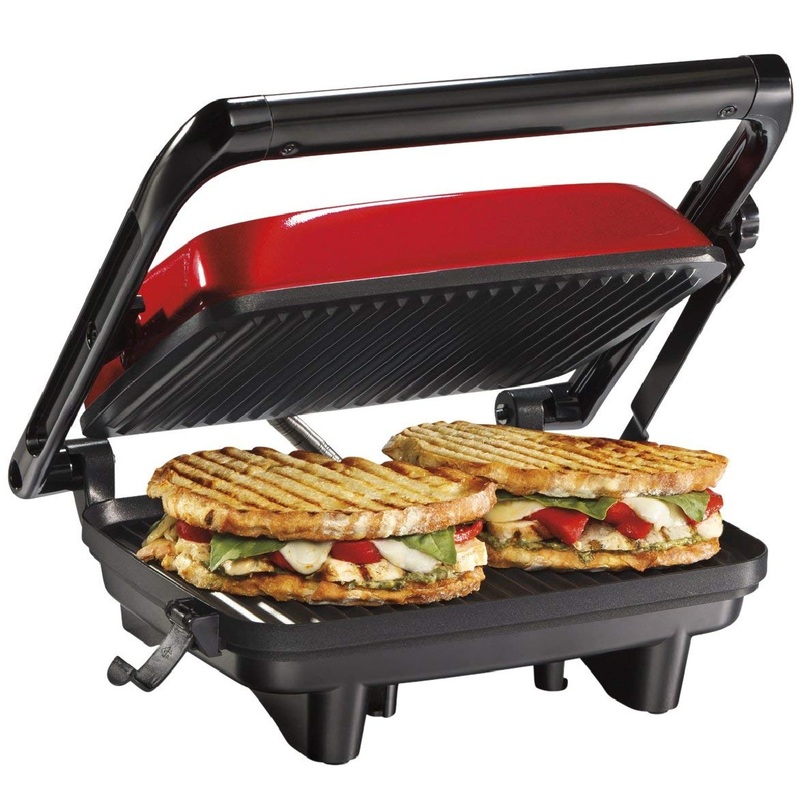 Customers who enjoy sandwiches with ridged grills will not be happy buying this Panini press as both plates are flat. If you’re a sandwich, pork chops, veggies or meat lover, the IMUSA USA GAU-80102 Large Electric Panini Press is exactly what you need to accomplish your cooking endeavors. It comes with power and heat indicator lights, a polished stainless steel exterior, a floating hinge for easy adjustment and a non-stick surface for easy cleanup. Finally, in our review, we have the Hamilton Beach 25462Z Panini Press. For those customers who might have disliked the IMUSA USA GAU-80102 Panini Press due to lack of a grill, the Hamilton Beach will definitely be your preferred option. An improved version of the previous 25450 model, the Hamilton Beach 25462Z panini press comes with more advanced features that are set to take your sandwich making experience to a whole new level. First, this Panini press is designed with a café-style lid that adjusts according to the thickness of your sandwich. Secondly, the Hamilton Beach has a spacious 10×8-inch cooking area that lets you make 2 to 3 sandwiches at a time. Finally, the Hamilton Beach 25462Z Sandwich Maker folds to stand upright for easy storage and is designed with power and preheat lights to notify you when the appliance is working. The Hamilton Beach 25462Z Sandwich Maker is available at a pocket-friendly price. This appliance folds upright for easy storage. The non-stick cooking areas are large making it easier to accomplish a variety of cooking projects. The cool-touch handle makes it easier for you to adjust the lid. This Panini press is small and perfect for small kitchens. This Panini press doesn’t have an on/off switch either does it have temperature control knobs. The top and bottom panels are non-removable making cleanup quite difficult. The Hamilton Beach 25462Z Panini Press is a perfect selection if you’re really looking for quality. However, one area of concern is the non-removable plates that make cleanup quite difficult. Aside from that, this Panini maker is really stylish and well-constructed making it a must-have for any sandwich aficionado. After a comprehensive review of all the five Panini presses in this guide, I come to my conclusion by naming the Cuisinart GR-4N 5-in-1 Griddler as the overall winner. First, this Panini press is designed with a polished stainless steel housing that makes it undoubtedly beautiful. Secondly, it comes with wide non-stick, removable, reversible and dishwasher safe plates that make cleanup a breeze. Finally, it is a 5-in-1 kitchen appliance that works as a Panini press, a contact grill, a full grill, full griddle and a half grill/half griddle. Why buy a Panini press for your kitchen? Well, there are many benefits of buying a Panini press for your kitchen. While some people may perceive it as a waste of money, this kitchen appliance has proved to be of great benefit especially to those people who can’t afford to kick start their mornings without taking a sandwich. Here are some key benefits of owning a Panini press. 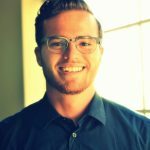 Have you ever thought of how much time and money you waste on a daily basis buying sandwiches from your favorite store? Well, if you do the math, you’ll discover that a lot of your time and money usually go to waste as compared to if you had a Panini press at home. Other than grilling your favorite sandwich, a Panini press is multifunctional and capable of grilling everything from steaks, fish, meat, pancakes to veggies. If you’re planning to invite friends over for the weekend, there’s nothing to worry about as your Panini press will keep your guests entertained with mouthwatering Panini treats, sandwiches and delectable steaks all weekend round. Whether it’s reheating your pizza or keeping your sandwich warm for long, a Panini press will keep you covered thanks to the available warming pan. Unlike reheating meals using a microwave, a Panini press is more efficient as it ensures that meals are reheated entirely without any guesswork. As you all know, the Panini press market is currently flooded with different products some of which will not suit your taste. To ensure that what you buy is worth your money, here are some things you need to look out for before parting with your money. Steel is the most common as its durable, cleans up easily and conducts heat very well. However, steel is very expensive to maintain. Cast iron is relatively cheaper and conducts heat very well. The only problem with cast iron is that it’s quite heavy and susceptible to rust. Unlike all the other materials, aluminum is light and excellent when it comes to transferring heat. The only drawback is that this material is susceptible to damage. Chrome, on the other hand, is smooth and perfect for making Panini press plates as it’s easy to use especially when cooking pancakes and eggs. The only drawback with chrome is that it can easily be damaged by sharp materials or abrasive when cleaning. Panini press plates are divided into three major groups namely Standard ½”, Medium ¾” and Heavy duty 1”. The best thing about thicker plates is that they retain heat and BTUs much longer making them the best for handling frozen foods. On the other hand, thinner plates are perfect for handling light cooking projects such as making sandwiches, sausages and ground meats. Although this is not a necessity, owning a Panini press with ceramic coated plates is an added advantage. First, ceramic coated plates are easy to clean and secondly, these plates are much durable as compared to their uncoated counterparts. How are you planning to use your Panini press? Well, your cooking endeavors will highly dictate the type of appliance you’re supposed to buy. If you’re planning to use it for small cooking projects, you can go for the small-sized Panini press and if it’s aimed for mammoth kitchen use, then you can consider the larger alternatives. Temperature range is another critical factor you can’t miss to check out when shopping for a Panini press. Depending on what you cook most, you can consider shopping for an appliance that has a higher temperature range that goes up to 600°F. Cleaning a Panini press especially after making pancakes, eggs and sandwiches can be overwhelming right? Now, to stay on the safe side—especially if you’re a kitchen enthusiast always on the go—you need to shop for an appliance that comes with removable plates. The best thing with most removable plates is that they’re dishwasher safe thus making it easy to clean and restore. To avoid any future disappointments, you need to do your math well and ensure that what you buy is enough to accomplish all your cooking needs. With that, here are additional factors you need to consider when buying a panini press. Does it have an adjustable thermostat? This is by far one of the most important factors you need to look at when choosing a Panini press. A Panini press with an adjustable thermostat means that you can cook anything from steaks to pancakes as you only need to adjust the temperature. Although it may sound trivial, the length of the cord is another critical factor that must be considered before shopping for a Panini press. Depending on your kitchen’s layout, sometimes it may be difficult to use this appliance especially if you only have a single power outlet with multiple electric appliances on the countertop. Therefore, to ensure that you use your Panini press at any point in the kitchen, make sure that you choose one with a long cord. Panini presses come with varying prices. There are budget ones and there are expensive ones. Depending on how much you’re willing to spend, you can opt to buy the expensive models (available with advanced features) or you can choose the cheaper alternatives (that come with limited features). Different plates: depending on how you like making your sandwich, you can opt to choose a Panini press with different plates (flat plates and grilled plates) to make cooking and cleanup much easier than ever. Warming pan: some Panini presses have the advantage of a warming pan. This accessory helps to keep your food warm for long while cooking other meals. If you’re the kind of person that likes serving hot food all at ones, then this feature will be a great addition. Dual temperature controls: Yes! You heard me well. Though rare, there are some Panini presses that come with dual temperature controls. Highly preferred by most chefs and professional cooks, this feature allows you to cook two separate meals at the same time using different temperatures. Drip trays: this add-on is quite interesting as it helps you to capture grease that might be running off the grills. If you’re the type of people who enjoy cooking greasy meals, then this add-on will be a great benefit. Well, the first step is to disconnect the appliance from the main power source. After it has cooled down, use a damp paper towel to wipe any oily residue off the grills. When you’re done, use warm soapy water and a sponge to clean the plates. In case they’re removable and dishwasher safe (check the manual to verify), soak them in the dishwasher for further cleaning. How do I store my Panini press? When it comes to storage, first make sure that the appliance is cool and dry before storage. Secondly, ensure that the power cord is wrapped properly on the base. Thirdly, make sure that the drip tray and the plates are inserted properly in the Panini press before storage. How do I maintain my Panini press? When it comes to maintenance, there are some points you need to keep in mind. First, avoid using metallic tools to remove food debris and residues as this can scratch the plates leading to damage. Secondly, avoid leaving plastic materials close to the machine’s surface when operating. Finally, always let the appliance cool down for about 30 minutes before cleaning. If you’re impressed by what you’ve read, then it’s time to own a Panini press. You see, these kitchen appliances are easy to use, easy to clean and more efficient as they eliminate guesswork from your cooking endeavors. Whether you’re a sandwich diehard, a pancakes lover or an eggs aficionado, this kitchen appliance will help you prepare healthy breakfasts to cheer up your mornings. Although there are so many features you need to check before making your purchase, this guide has done all the homework for you leaving you with only one task of choosing which Panini press will work for you depending on your daily requirements. Finally, my final tip to you is to mention that not all expensive Panini presses are fancy. Sometimes, simple is best. Therefore, before making the final decision, ensure that you check the features, the specifications and the warranty just to be sure that what you buy is worth the price.